This article discusses battery charging systems that are “artificially powered” by electricity or an engine (as opposed to sun or wind power) and the methods these systems use to chargeso RV and marine batteries. It is the second post in our four part series on RV and Marine Battery charging systems. What Happens When Solar and Shore Power Run At Once? What Values Do You Program into a Charging System? There are two basic types of multi-stage chargers for RVs and boats: those that are “artificially powered,” either by electricity, by an engine or by a generator, and those that are “naturally powered” by the sun (or wind). Note: Although this series doesn’t discuss wind charging systems, the same principles apply. The biggest difference between these two types of charging systems is that artificially powered charging systems — converters, inverter/chargers and alternators — can all deliver the maximum amount of current they are rated for as soon as they are turned on. In contrast, “naturally powered” chargers may or may not be able to deliver their maximum rated current when called upon to do so. As long as there’s gas, it’s good to go. Solar charge controllers can deliver their maximum rated current only if they are connected to a large enough solar power array and that array is exactly perpendicular to full sunshine. Unfortunately, no matter how big the solar panel array is, these charging systems spend most of their time operating in sub-optimal conditions when the sun is low in the sky or filtered by clouds or totally absent because it is nighttime. In addition, if a big appliance is turned on in the RV or boat while the batteries are being charged, the artificially powered charging systems can meet the challenge and provide the current that is needed (up to their rated current output and up to the limits of the power source) to keep the batteries at their target charging voltage. 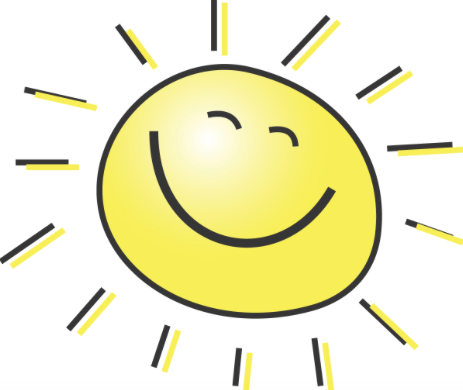 The sun’s out — yay! However, solar charge controllers may or may not be able to meet the challenge, depending on the time of day and amount of cloud cover. In fact, if the current draw is big enough, not only will the solar charge controller fail to keep up with the sudden demand, but the net effect on the batteries may be that they are temporarily being discharged a little bit rather than charged. Therefore, solar charge controllers have a lot of extra complexity built into their charging algorithms so they can handle the situations where, for whatever reason (lack of sun and/or too much demand from the appliances in the RV or boat) they aren’t actually charging the batteries but are just slowing down the discharge rate! Artificially powered charging systems can all be turned on or off with the flick of a switch. Most systems will test the battery voltage to see if they should jump into the Bulk stage as soon as they are turned on. This gives you a way to force the batteries into the Bulk stage and start the charging process from scratch. Solar charge controllers operate 24/7, and they rely on an internal algorithm to determine when it is morning and time to start the Bulk charging stage. Not all solar charge controllers are designed to have an easy way for the user to put the batteries in a Bulk charging stage at any time of day other than dawn. Many artificially powered charging systems are programmable, but usually the choices are minimal. If they can be programmed at all, it is generally done with dip switches or simple buttons. In contrast, big solar charge controllers are complex enough and have so many programmable options that they often have a screen display and a menu driven interface. Some charging systems have preset groups of voltage values, and all you can select is whether your batteries are Flooded, AGM or Gel. The charger then assigns voltage values for the charging stages based on battery type. In this case, the charging system manufacturer is guessing what voltages are appropriate for your batteries. The battery manufacturer may have different specs! The most sophisticated (and expensive) charging systems allow you to enter any value you want for the individual charging voltages as well as the length of time to remain in the Absorb stage and other values as well. Even if you don’t study the charging algorithm that is used by the charging systems on your RV or boat, it is worthwhile to find out what the default voltages are for the Bulk, Absorb and Float stages are on each device. There are rules of thumb for what the charging voltages should be for the various battery types, with flooded batteries requiring higher charging voltages than AGM and Gel batteries. The general consensus I found in my research was that flooded batteries preferred a Bulk/Absorb voltage in the range of 14.6 – 14.8 volts while AGM and Gel batteries prefer to be around 14.4 volts. Because of this general consensus, I set up all the charging systems on our boat with Bulk and Absorb values around 14.4 volts so we wouldn’t fry our four Mastervolt 4D AGM batteries house batteries and our Group 27 start battery. Needless to say, I was quite surprised when we installed our four new Trojan T-105 Reliant AGM 6 volt batteries in our trailer, that the engineers I spoke with at Trojan Battery recommended we set the Bulk and Absorb stages of our charging systems to 14.7 volts. They said the vast majority of battery failures are from chronically undercharged batteries, so they preferred that their AGM batteries be charged at this higher voltage. I never spoke with anyone at Mastervolt back in our cruising days, and their documentation didn’t specify charging voltages. In hindsight, perhaps we should have been charging the batteries on our boat to higher Bulk and Absorb voltages. They would have charged faster, which would have been awesome, especially on solar, because our solar panel array was a little small (555 watts), and getting the batteries fully charged by day’s end was a challenge unless we turned off our DC freezer. Lesson learned: If you can’t find your battery manufacturer’s recommended charging voltages in their documentation, give them a call! The next sections take a look at a few artificially powered charging devices we have used and the algorithms they employ for battery charging. Most trailers are equipped with a converter to charge the batteries from shore power (via electric hookups or a portable gas generator). The shocking thing about these converters is that many of them are just single stage trickle chargers. (Note: if you are confused about what converters and inverters are, click here). We had never thought much about our converter, because we use it very rarely. We don’t ever get electrical hookups, so our converter is used only when we fire up our gas generator, which happens just a few times a year. We had always assumed that the Atwood SRV 55 amp converter that came with our Hitchhiker II LS fifth wheel was a multi-stage charger. However, we discvoered a few months ago that this converter is actually a single stage trickle charger. It brings the batteries up to 13.4 volts and leaves them there indefinitely, as long as the converter has AC power supplied to it. This is startling for two reasons. First of all, since we boondock all the time, this means that whenever we turn on our generator to charge our batteries (after a few days of stormy weather), rather than giving the batteries a fast blast of Bulk charge followed by Absorb and Float, the batteries are immediately put into a Float stage and left there. Rather than getting a quickie does of lots of current and then trailing off to less and less current, the batteries get an anemic amount of current the whole time the generator is running. What a waste of fuel! And who wants to listen to that noisy thing for that long! Rather than taking an hour or two to charge the batteries completely, it could take 8 hours or more. Ugh! Secondly, single stage converters like this Atwood don’t exercise the batteries at all when they are left on shorepower via electrical hookups, and the batteries deteriorate more quickly. This is an important consideration for an RV that is plugged into shore power month after month. It is important for batteries to go through the Bulk and Absorb stages periodically. 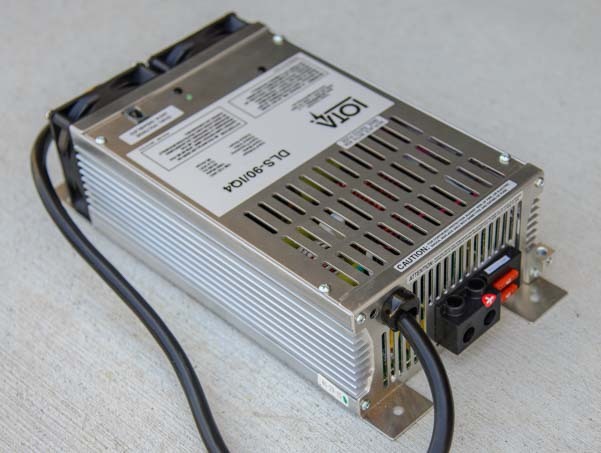 We decided to replace our factory-installed single-stage Atwood 55 amp converter with an Iota DLS 90 converter / IQ4 smart charger a few months ago so that on the days that we use our generator we could use it for a very short time rather than running it all day. Besides wanting a true multi-stage charger that could load the batteries up with a lot of current at the beginning of the charge cycle, we also realized our old factory installed converter was too small. Remember that 25% rule for sizing batteries and chargers from the last post? Our converter had been sized for the two Group 24 12-volt batteries (total capacity 140 amp-hours) that had come with our RV, and we had upgraded to four Trojan T-105 Reliant AGM 6 volt batteries which gives us a total capacity of 435 amp-hours. Our new Iota DLS-90 / IQ4 is a 90 amp converter which is much more appropriately sized to the new battery bank. And what a world of difference there is between these two converters! The Iota DLS 90 / IQ4 is far more sophisticated. It puts the batteries into a true Bulk charge state as soon as AC power is available (for us, that is when we turn on the generator with the shorepower cord plugged into it). Then, after cycling through Absorb to Float, it keeps the batteries in the Float stage for seven days (not applicable to us with our generator, but important for folks who get electric hookups), and then it cycles them through Bulk and Absorb again. BULK: Whenver the batteries are below 12.8 volts (i.e., when first plugging into shore power or when a bunch of appliances are turned on in the RV or boat) deliver the maximum current possible (up to 90 amps DC) until the batteries reach a voltage of 14.6 volts, then switch to Absorb. If they don’t reach 14.8 volts within four hours, switch to Absorb anyways. ABSORB: For eight hours, deliver enough current to hold the batteries at 14.2 volts. FLOAT: For seven days, deliver enough current to hold the batteries at 13.6 volts. Then go through the Bulk and Absorb stages before resuming the Float stage. The system is fully automatic and none of these values or times are programmable. Note: For readers who have studied the spec sheets on the Iota DLS-90/IQ4, this outline differs slightly from what you read. I had a lengthy conversation with an engineer at Iota who explained the details of how this converter works. The documentation refers to the weekly return to Bulk and Absorb as an “Equalization” stage, but the voltages and times are actually those of the Bulk and Absorb stages. As noted in the first post in this series, equalization is generally done at 15 volts or more for less than 8 hours. In addition, the documentation describes the converter’s power supply ramping up to 14.8 volts during Bulk, but doesn’t explain that the actual trigger point that switches the batteries from Bulk to Absorb is 14.6 volts. A few weeks ago we endured several days of gray skies and rain while we were driving from Florida into southern Georgia. Our solar panels were producing very little current, and our new Trojan T-105 Reliant AGM batteries were becoming depleted. There was no sign of sun in sight. 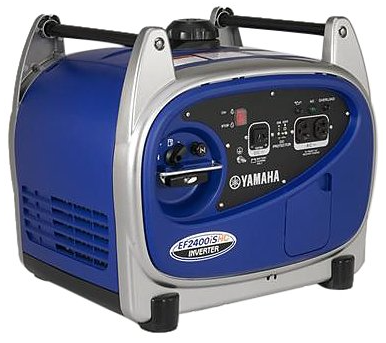 We set up our Yamaha 2400i portable gas generator and plugged our shore power cord into it. We clamped the jaws of our trusty clamp-on ammeter around one of the battery cables and were truly astonished to see 67 amps going into the batteries. Yowza!! Within two hours the batteries had accepted roughly 100 amp-hours of charge and we turned the generator off. Our old converter would have taken about 8 hours or more to do the equivalent. Many motorhomes and cruising boats are equipped with an Inverter/Charger to charge the batteries when the RV or boat is plugged into shore power. Our Hunter 44DS sailboat was equipped with a Xantrex Freedom 25 inverter/charger which was factory installed in the boat. 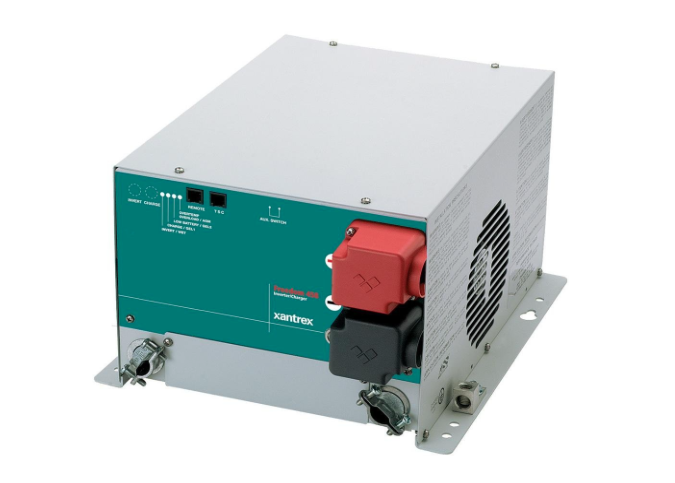 Xantrex has since become Schneider Electric, and a comparable model being sold today is the Schneider Electric 2500 watt inverter/charger. I haven’t found an online manual for it, so I don’t know if the charging algorithm or programmability of the unit has changed. If you wanted different voltages, you could select the Flooded or Gel values instead simply by indicating that your batteries were Flooded or Gel, even if they weren’t. ABSORB: For up to 3 hours, deliver as much current as needed to keep the batteries at the Absorb voltage. If the current necessary to keep the batteries at the Absorb voltage drops below 15 amps before the 3 hours is up, stop charging and let the battery voltage settle down to the Float voltage. FLOAT: Deliver enough current to hold the batteries at the Float voltage., and keep the batteries at the Float voltage indefinitely. EQUALIZE: Whenever you want to equalize the batteries, you can manually put them into an Equalize charging stage. The inverter/charger will deliver enough current to bring the batteries up to 16.3 volts and will keep them at that voltage for 8 hours. Notice how different the Xantrex inverter/charger is than the Iota DLS 90 / IQ4 Converter!. Both the voltages and lengths of time are quite different. Even more interesting, however, is where the heck did that 15 amp thing come from for switching from Absorb to Float? As a rule of thumb, it is thought that when the batteries need less than 2% of the amp-hour capacity of the entire battery bank in order to maintain the Absorb voltage, then they are pretty close to full charge and can be put in the trickle charge Float stage. This 15 amp switchover is an attempt at implementing this 2% rule. However, because the 15 amp value is not modifiable, the assumption is that the battery bank is 750 amp-hours (15 is 2% of 750). That’s quite an assumption! More sophisticated charge controllers allow you to program the current at which you want the system to switch from Absorb to Float. Our boat’s battery bank was 710 amp-hours, so a more accurate number would have been 2% of 710, or 14 amps. 15 amps versus 14 amps — big deal, right? It’s true, for an inverter that is going to be running 24/7 when you are plugged into shore power, that slight difference is not significant. But if you are using the inverter/charger with a generator (to supplement solar power during stormy days), you might want to stay in the Absorb stage for the full 3 hours rather than dropping into Float as soon as the current dips below 15 amps! Also, as I’ll show in the next post in this series, 15 amps was still much too high a current — in our case — to switch from Absorb to Float when we charged our boat’s battery bank with our solar charge controller. We wanted the switch-over current from Absorb to Float to be only 5 amps. 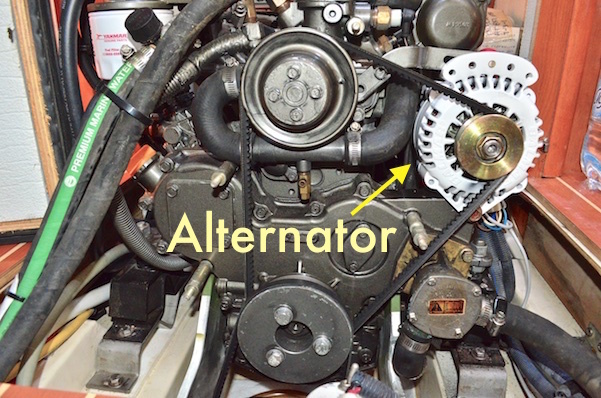 Cruising sailboats and motorhomes are equipped with an engine alternator that charges the batteries. Our sailboat had a 100 amp Balmar alternator with an ARS-4 Smart Charger which was a multi-stage voltage regulator. BULK: For 36 minutes deliver maximum current until the batteries reach the Bulk voltage. If the Bulk voltage is not attained in 36 minutes, then continue delivering that same current for 6 more minutes. If, again, the Bulk voltage has not been reached, continue for 6 more minutes and check again. Repeat this cycle until the Bulk voltage is reached. ABSORB: For two hours, deliver enough current to keep the batteries at the Absorb voltage. If after two hours the batteries are not at the Absorb voltage (due to large current draws from systems on the boat or RV), check every six minutes until the Absorb voltage is achieved. FLOAT: For six hours, deliver enough current to keep the batteries at the Float voltage. After six hours, increase the current being delivered to the batteries to bring them up to the Abosrb voltage and keep them at that voltage 36 minutes. Then return to Float for six more hours. Repeat this cycle indefinitely. EQUALIZE: The equalizing stage is started manually and you can choose the voltage and time limit. Notice that with this particular engine alternator the batteries are not left in the Float stage indefinitely. Instead, they are put into Float for six hours and then in Absorb for 36 minutes, cycling between those two stages indefinitely. How long is “indefinitely” when it comes to running a boat’s engine, anyway? Well, we had lots of 24 to 55 hour passages on our cruise where the engine ran nonstop. The alternator cycled between Absorb and Float quite a bit during those passages. One really important aspect of using an alternator to charge a large battery bank, especially if the engine will be running when huge loads are put on the batteries (like the anchor windlass or power winches), is the 25% rule of thumb I mentioned in the first post of this series: the rated output current of a charger should be roughly 25% of the capacity of the battery bank. Most cruising boats have very large battery banks. Ours was 710 amp-hours, and we knew lots of cruisers with 600 amp-hour banks all they way up to 1,000 amp-hour banks. For us, 25% of our 710 amp-hour battery bank calculates to 177, so our alternator needed to be a 180 amp alternator to be sized correctly. The problem is that most alternators over 100 amps require a double pulley system on the engine. That’s complicated, and very few cruisers choose to go that route. Instead, they tend to limp along with undersized alternators. And what is the most common system failure we saw sailors experiencing on their cruising boats? Alternators! Not only are most cruising boat alternators undersized, most alternators are called upon to power the anchor windlass, lifting a 60 or 70 lb. anchor along with 100 to 300 feet of stainless steel chain from a depth of 20 or 30 feet. Frequently, it does this in pre-dawn hours of the morning, after the sailors have spent an evening with lights and laptops running and maybe watching a movie. The boat’s batteries are depleted and the solar panels are still asleep and aren’t helping out. It’s like asking a weak and starving person to move furniture. 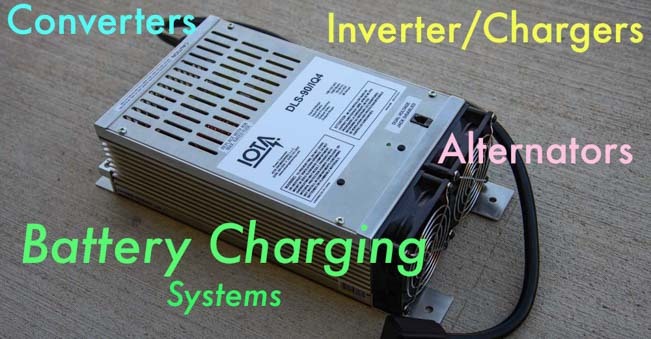 The manufacturers of converters, inverter/chargers and diesel engine alternators each approach the methodology of multi-stage charging in unique ways, and the charging systems described on this page are just a few examples from our own personal experience. If you have the time and the inclination, read the user manuals of the charging systems on your RV or boat, find out what your battery manufacturer gives for recommended settings, and set your charging systems up accordingly. Combining Solar Power with Shore Power or an Engine Alternator – What happens when two chargers run at once? Wet Cell vs. AGM Batteries - How do these batteries stack up and what's the best way to wire them? Which Solar Panels Work Best? - Flexible panels or rigid? 12 or 24 volt? Monocrystalline or Polycrystalline?? This entry was posted in Solar and tagged Battery Charging, New, Non-Travel, Popular Articles, RV Tech Tips, Solar-Power, Trailer Tech by Roads Less Traveled. Bookmark the permalink. More great content Emily. I’m trying to understand the Echo charger on our coach and if it’s operating correctly. It’s limited to 15amps output to the chassis (starting) batteries and some features of our coach use the chassis batteries as a 12V source. We haven’t used a Xantrex Echo charger, Mike, so I can’t speak from experience with that device. It looks like it’s a device that allows the start battery to be isolated from the house battery yet be charged by the same source by raising the start battery to the house battery’s charging voltage whenever it drops 0.5 volts or more below the house battery’s voltage. First I would like to thank you for all the great info you have provided on your website. With all of the products on the market and the technical understanding needed to set up the best system possible makes it a daunting task trying to find the right answers. One thing I can’t seem to find a definitive answer to is the question of which product is better, a smart battery isolator or an automatic charge relay. I was about to purchase a battery doctor but the realized that it stated that it will not work with a system that charges via shore power/generator. If you had any suggestions it would be much appreciated. Furthermore a complete wiring diagram from someone who is certainly very good at designing safe and highly efficient systems would be great. Thanks so much. Thanks for reading and appreciating, Toby. We do not have wiring diagrams.